Based on the “levelised cost” of electricity, which estimates the net present value of the costs of a generating system divided by the expected output over its lifetime, solar power is getting close to gas and coal as an attractively cheap source of power. 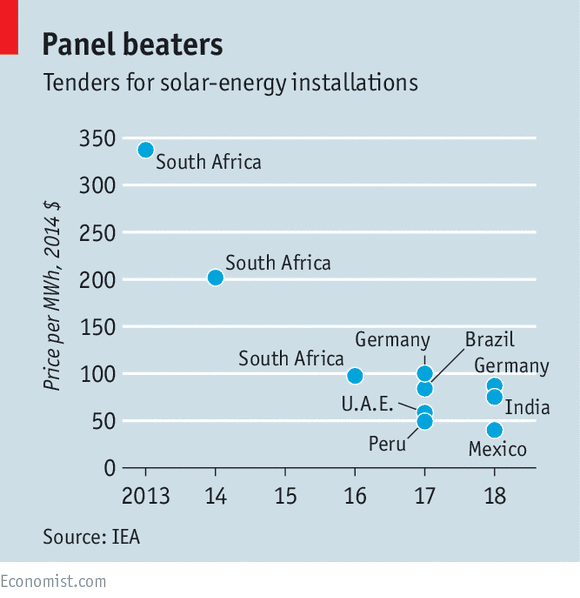 Auctions of long-term contracts to purchase solar power in developing countries such as South Africa, the United Arab Emirates, Peru and Mexico provide real-world evidence of this phenomena. 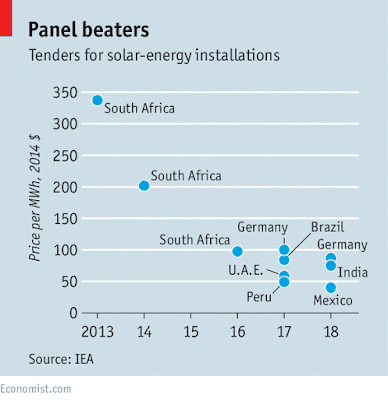 Since November 2014, when Dubai awarded a project to build 200 MW of solar power at less than $60 a megawatt hour (MWh), auctions have become increasingly competitive. And recently, on May 1, 2016, the Dubai Electricity and Water Authority have received bids for the 800 MW Sheikh Maktoum Solar Park Phase III as low as $30 per MWh. Auction prices dropped twice in one and half year, very impressive development!